The Hand Vacuum Cup (with guage) is made of strong durable aluminium together with an ergonomic handle and includes an integrated vacuum gauge and priming pump. This vacuum cup has the capacity for nearly any manual lift. It is rugged and dependable. Pulling the hand lever repeatedly produces the vacuum, 3 strokes produce full vacuum. The vacuum can be continuously monit.. 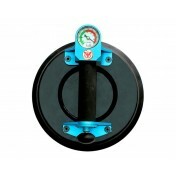 The Oval Hand Vacuum Cup is made of aluminium with an ergonomic handle including an integrated vacuum gauge and a pump. It is suitable for non-porous materials with smooth and curved surfaces such as glass, stone and steel pipes. 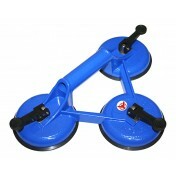 The vacuum is created by pulling the hand pump repeatedly. 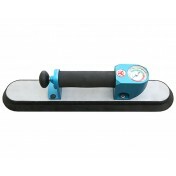 The vacuum can be continuously monitored via the pressure gauge. Additional pumping .. The Double Suction Cup is suitable for use on glass, tiles, plastic or other smooth surfaced non-porous material and can also be used for pulling out dents. All are fitted with a rubber seal, which will not damage contact surface during the lifting action. 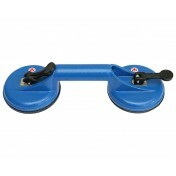 Hand lift only, must not be used in conjunction with mechanical lifting equipment. Note: Pricing is per piece. Speci.. The Triple Suction Cup is suitable for use on glass, tiles, plastic or other smooth surfaced non-porous material and can also be used for pulling out dents. All are fitted with a rubber seal, which will not damage contact surface during the lifting action. Hand lift only, must not be used in conjunction with mechanical lifting equipment.contact surface during the lifting action. ..